The current debate about the Greek debt has given rise to all sorts of threats, first of all against Tsípras’ government, then against the Greek voters. Without becoming involved in a discussion of the repugnant side of this affair, Thierry Meyssan observes the international campaign against Greece leaving the Euro zone. He shines a light on the historic project of the European Union and the Euro, as they were formulated in 1946 by Churchill and Truman, and concludes that in the end, Greece is trapped by the international geopolitical environment and not by its economic situation. Joseph Retinger, Polish ex-fascist who became a British agent. At the request of MI6, he founded the European League for Economic Cooperation, of which he became Secretary-General. In that function, he must be considered the father of the Euro. After that, he directed the European Movement and created the Bilderberg Club. The Greek referendum provoked some sharp debates in the European Union, which illustrates the prevailing state of ignorance about the rules of the game. The participants tore each other to pieces in their attempt to decide whether or not the Greeks were responsible for their debt, although they were always careful to avoid accusing their creditors of usury. But they affronted one another ignorant of the history of the Euro and the reasons for its creation. Since the Rome Treaty, 64 years ago, a succession of administrative bodies of the « European Project » (CECA, CEE, UE) have been spending colossal, unprecedented sums of money to finance their propaganda in the media. Daily, hundreds of articles, radio and television programmes are financed by Brussels in order to inculcate us with a false version of its history, and make us believe that the present « European Project » is the same as project as it was between the two World Wars. The archives are now open to all. They show that in 1946, Winston Churchill and Harry Truman decided to divide the European continent into two : on one side, their vassals, on the other, the USSR and theirs. In order to ensure that no state would be able to free itself from their suzerainty, they decided to manipulate the ideals of their time. What was then known as the « European Project » was never intended to defend any pretended common values, but to create a liaison between the exploitation of prime materials and the defence industries of France and Germany in order to be sure that these countries would be incapable of waging war again (theory of Louis Loucheur and Comte Richard de Coudenhove-Kalergi ). There is no attempt to deny their profound ideological differences, but to ensure that they will never again confront one another by force. British MI6 and the CIA were then put in charge of organising the first « European Congress » in the Hague in May 1948, which was attended by 750 personalities (including François Mitterrand) from 16 countries. It was an attempt to resuscitate the « Federation of Europe Project » (drawn up by Walter Hallstein —the future President of the European Commission – for Chancellor Adolf Hitler) on the basis of Coudenhove-Kalergi’s rhetoric. Several false ideas about this Congress need to be corrected. First of all, it needs to be placed in its true context. The United States and the United Kingdom had just declared Cold War on the USSR. The Soviets responded by supporting the Czech Communists who managed to legally seize power during the « Prague Coup » – (« Victorious February » according to Soviet historiography. Washington and London then organised the Brussels Treaty which anticipated the creation of NATO. All the participants at the European Congress were pro-Anglo-Saxon and anti-Soviet. Secondly, when Winston Churchill gave his speech, he employed the term « European » to designate the inhabitants of the European continent who claimed to be anti-Communist (but not those of the United Kingdom who, according to him, are not Europeans). It was out of the question for Churchill, in those days, to accept that London should adhere to the European Union other than for its supervision. 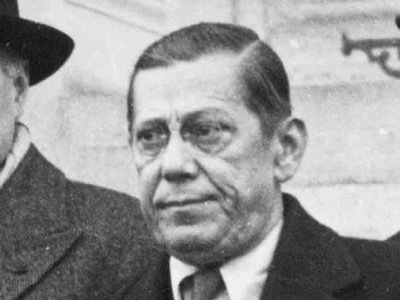 Thirdly, two tendencies were born during the Congress – the « Unionists », whose sole aim was to combine all means to resist the expansion of Communism – and the « Federalists », who wanted to realise the Nazi project of a Federal State placed under the authority of a non-elected administration. Walter Hallstein, a former senior civil servant for the German government, drew up Hitler’s project for Federal Europe. This called for the destruction of the European states and the federation of the populations, according to ethnic background, around the Aryan Reich. The ensemble would have been submitted to a non-elected dictatorship, controlled by Berlin. 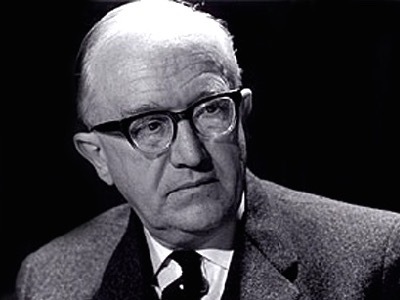 At the Liberation, he began organising his project with the help of the Anglo-Saxons, and in 1958, became the first President of the European Commission. The Congress specified all that has been acheived since, under the successive titles of CECA, EEC and EU. Le Congress adopted the principle of a common currency. But MI6 and the CIA had already founded the Independent League for European Cooperation (ILEC)  – which has since become the European League for Economic Cooperation (ELEC). It’s objectives were, once the institutions of the Union had been created, to change from common money (the future European Currency Unit – ECU) to a single currency (the Euro), so that Union member countries would be unable to leave . This is the project that François Mitterrand realised in 1992. Considering the History and the participation of François Mitterrand at the Hague Congress in 1948, it would be absurd to pretend today that the Euro had any other function. That’s why, quite logically, the current Treaty does not envisage the exit from the Euro – this obliges Greece, should it so desire, to leave the Union first, and only then to leave the Euro. At the end of the 1960’s, the United Kingdom refused to participate in the Vietnam war and brought its troops back from the Persian Gulf and Asia. The British stopped thinking of themselves as the 51st state of the USA, and began to invoke their « special relationship » with Washington. Thus they decided to join the Union (1973). With the dissolution of the USSR, the United States remained the undisputed masters of the game. The United Kingdom helped them, and the other states obeyed them. As a result, the Union never gave any thought to its expansion towards the East, doing little more than validate a decision taken by Washington and announced by Secretary of State James Baker. In the same way, it has also adopted the US military strategy  as well as their economic and social models, which are characterised by some fundamental inequalities. The Greek referendum reveals a watershed – on the one side, the European elites, who are finding life increasingly easy, and unreservedly support the « European Project » – and, on the other side, the working classes, who are suffering from the system and reject it – a phenomenon which had already been expressed during the ratification of the Treaty of Maastricht, but only at the national level, by Denmark and France, in 1992.
and that the question asked was neither clear nor comprehensible (although the Union proposition, published in the Journal Officiel, is much shorter and simpler than the European Treaties which were submitted for referendum). However, the polemic fizzled out after the Greek State Council, alarmed by certain particuliar aspects of these three points, validated the legality of the consultation. The dominant media then declared that if the nation voted « no », the Greek economy would be taking a leap into the unknown. And yet the fact of belonging to the Eurozone does not guarantee economic performance. If we refer to the International Monetary Fund’s list for the Gross Domestic Product (GDP) in Purchasing Power Parity (PPP), only one member state of the Union is amongst the world’s top ten : the fiscal paradise of Luxembourg. France only figures in 25th position out of 193. The growth of the European Union was 1,2 % in 2014, which places it in 173rd place – which is to say one of the world’s worst results (the world average is 2,2 %). 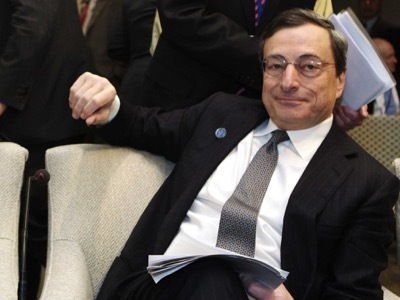 Mario Draghi, President of the European Central Bank, is Goldman-Sachs’ ex-vice-President for Europe. He hid from the European Parliament his rôle in the embezzlement operated by the bank for the account of the Greek government, although the facts are attested by the bank’s own documents. We are obliged to note that belonging to the Union and using the Euro are no guarantees for success. So if the European elites support this « project », it’s because it is profitable for them. Indeed, by creating a single market, then a single money, the Unionists have re-shuffled the deck. As from now, the differences are no longer between the member states, but between the social classes, which have become uniform at the European scale. That is why the richer classes defend the Union, while the poorer hope for a return to their member states. For many years, the debate has been rendered incomprehensible by the official vocabulary – Europeans are not the bearers of Europen culture, but simply members of the Union. Since the Cold War, we affirm that the people of Russia are not European, and by leaving the Union at this time, Greece would exit the European culture of which it is the cradle. Well, « dogs don’t breed cats ». The Union was conceived by the Anglo-Saxons, with a few ex-Nazis, against the USSR. It supports the Ukranian government today, Nazis included, and has declared economic war on Russia by masking it with the title of « sanctions ». As its name does not inform you, the Union was not created in order to unify the European continent, but to divide it, and to definitively invalidate Russia. This is what Charles De Gaulle denounced when he pled for a Europe which would stretch from « Brest to Vladivostock ». The Unionists affirm that the « European Project » has kept the peace in Europe for the last 65 years. But do they mention that the Union and its vassals belong to the United States ? In reality, that is what has kept the peace between the Western European states, while also keeping their rivalities out of the NATO zone. Is it necessary to mention, for example, that the members of the European Union supported different sides in ex-Yugoslavia before they re-unified behind NATO ? And should we be worying about the possibility that once they became sovereign again, the members of the Union would then start quarreling again ? Jean-Claude Juncker expressed anger about the Greek referendum, which he qualifiued as « treason ». 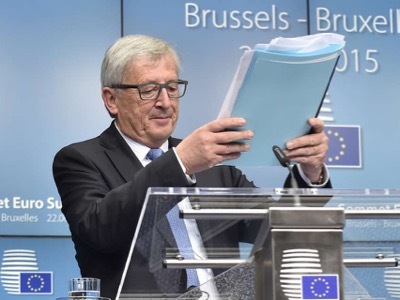 M. Juncker had been obliged to resign his position as Prime Minister of Luxembourg after it was revealed that he belonged to the Atlantic Alliance spy network Gladio. One year later, he became President of the European Commission. To return to the Greek situation, the experts have easily demonstrated that this debt can be imputable to national problems which have remained un-resolved since the end of the Ottoman Empire, just as much as to a swindle by the major private banks and political leaders. Moreover, this debt is insolvent, as are the debts of the major developed states . In any case, Athens could easily settle things by refusing to pay the repugnant part of its debt , leaving the Union, and by allying itself with Russia, which is for Greece an historic and cultural partner far more serious than the Brussels bureaucracy. The desire of Moscow and Beijing to invest in Grece and create new international institutions there is an open secret. However, the Greek situation is all the more complicated in that it is a member of NATO, and that the Alliance had organised a military coup d’état in 1967, to prevent Greece from moving closer to Russia . « Histoire secrète de l’Union européenne », par Thierry Meyssan,Réseau Voltaire, 28 juin 2004. The French section takes the name of the Ligue Européenne de Co-operation Economique (LECE). It was presided by Edmond Giscard d’Estaing, father of the future President de la République and creator of the ECU. MI6: Inside the Covert World of Her Majesty’s Secret Intelligence Service, Stephen Dorril, The Free Press, 2000. « Stratégie européenne de sécurité », Réseau Voltaire, 12 décembre 2003. « Thorbjørn Jagland destitué de ses fonctions de président du Nobel de la Paix », Réseau Voltaire, 5 mars 2015. « Selon la BRI, la dette des États développés est insolvable », Réseau Voltaire, 13 avril 2010. Cf. the economic theory of Alexander Sack. « La guerre secrète en Grèce », Daniele Ganser ; « Grèce, le facteur Otan », Manlio Dinucci, Traduction Marie-Ange Patrizio, Il Manifesto(Italie), Réseau Voltaire, 24 août 2013 et 7 avril 2015.